The Aviation Pioneers Memorial commemorates one of the first commercial airline crashes in Australia and its victims. 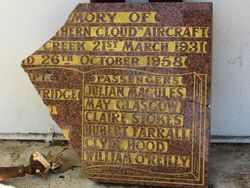 The memorial contains artefacts recovered from the Avro 618 Ten aircraft Southern Cloud, which crashed on 21 March 1931 in the Toolong range of the Australian Alps. The wreck was not found until 26 October 1958. 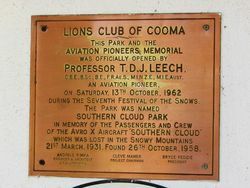 The history of the Southern Cloud plane disaster is now well known around the world but the construction of the memorial by the Cooma Lions Club in 1962 should also be celebrated. 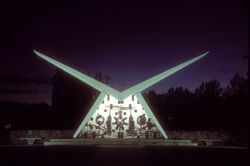 It is now 50 years old and was opened on October 13 1962. 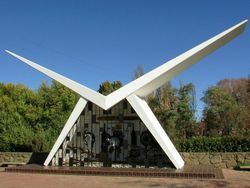 It not only is a memorial to the victims but to one of the first commercial airline crashes in Australia. Some questions will never be solved but as a result of subsequent investigations revolutionised safety systems for modern airline travel such as wireless transmission and weather forecasting. 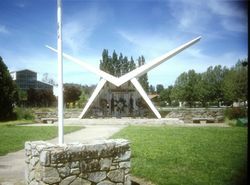 The land on which it is built was originally a portion of the Hain Stores land donated to the Lions Club by Lindsay Hain, then subsequently resumed by the council - an ideal position for tourists to view the memorial. Andrius Rimka's design presented some construction problems but the Lions Club didn't shy away from the challenge. The concrete was mixed and poured by hand with no pre-mixed concrete or concrete pumps available. All formwork and steelwork was carried out by Lions labour. Although the idea of a memorial was discussed earlier, commencement and completion was brought forward to coincide with the "Festival of the Snows". This period was a very busy time for the Lions Club with many other projects being carried out at the same time. 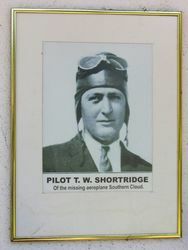 After the crash site was discovered by Tom Sonter in 1958 and investigations completed, unfortunately many items were souvenired by people from around the district and beyond. 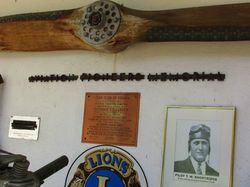 Some items have been returned to the Cooma Lions Club and added to the Memorial. 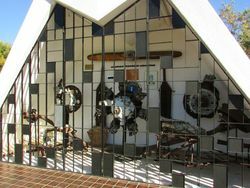 We are again appealing for any parts of the aircraft be returned for inclusion in the memorial, rather than rotting or rusting in a back shed. Thanks to Cooma Lions historian, Tony Mackenzie many more photos and articles are on display in the Visitors Centre. 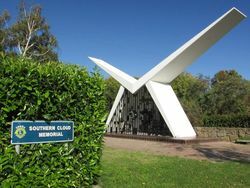 More interesting information can be obtained about the Southern Cloud story from the updated recording installed in the memorial by the Club some two years ago. Cooma-Monaro Express, 24th May 2015. C.B.E., B.Sc., F.R.Ae.S., M.I.N.Z.E., M.I.E. AUST. 21st MARCH 1931, FOUND 26th OCTOBER, 1958.